End of Day 1. Counting the votes. With three votes, Rune is lynched. He is a wolf. Night 2 begins. Wolf, Ranger, Seer - do your work. People who did not vote toDay please do so toMorrow. The Blossom of Dwimordene had a fine eulogy to send her off. The warg echoed after the latest poem, "bees, freeze, knees...". "Enough poetry!" a cry went around. "Dare not you offer insult to poetry", said the gorcrow hanging upside down, " or henceforth I shall offer suspicion only in verse!" "Tweeze, frees, sneeze..." went on the warg. "Yes, thank you - Geez!" the warg agreed happily. Everyone ignored him. "It is the fox," said the gorcrow. "Not so," said the fox, looking into everyone's eyes in turn and staring a little too long. "It is the surprise creature." "It's the Wight," said the warg. "It's the warg, said the bat. "It's the dog," said the fell voice. The pomeranian lifted her ears at the mention and bared her pointy teeth. "Always you debate idiocy and never listen to intelligent people!" She barked. "You said right off it is the fox. So lynch him! He's unsettling enough as it is, and it ruins my appetite." "Surprise!" shouted the surprise creature as he pulled out a bazooka wielding raccoon who shot the whole round into the fox. The fox's body turned into one of a wolf. Then they ate the raccoon for dinner. Last edited by Galadriel55; 12-29-2017 at 11:11 PM. "Who are you? What are you doing here? This is my dwelling!" "You won't have need of it much longer." Last edited by Galadriel55; 12-31-2017 at 08:11 AM. Excellent - scratch one wolf! It's a shame about Zil (sorry I suspected you); I think his second vote for Rune would have cleared him in my eyes. Nerwen - still nothing to go on. Sally - cast a bit of suspicion on Boro, then dropped the third vote on Rune - but at a time when we would have needed two votes for the same alternate, in 20 minutes, from the remaining 3 people (6 votes cast + Sally makes 7 accounted for), for him not to be lynched. This could be a safe wolf vote, but doesn't really say anything either way. Boro - Rune's early attempt to follow me onto his case makes him look less like a wolf, but his goofy behavior and 'let's not lynch! Wait, let's lynch Nerwen for no real reason!' 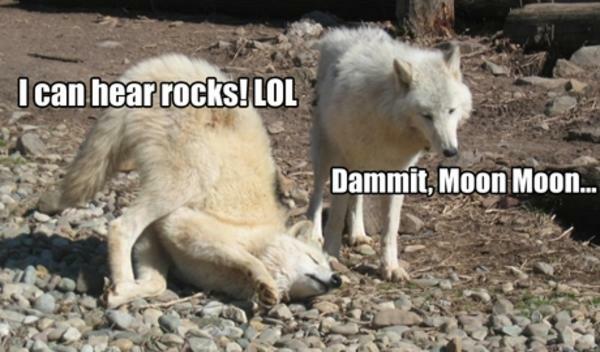 lends support to Pitch's Moon Moon theory. Lalaith - cast a vote for Sally that spread the vote out to five (half the village!). Gave at least marginal reasoning (Sally has been a pop-in-and-out wolf before? ), but I'm still dubious. Pitch - Now that we know he was an ordo, I guess it's okay to quote Zil's 'sensible Pitch is sensible'. Introduced the BoroMoon theory, then noted that BoroWolf has acted cobblerish before. Voted for Boro on that ground. Also argued against lynching people 'just in case'. Nothing really to suspect here (for me). So that's 3/8 with absolutely no evidence, which is... great. -_- I'd like to hear more from yesterday's latecomers - in particular, why Sally thought it was dangerous to need 2 votes out of 3 in 20 minutes, and why Lalaith felt we needed five lynch candidates. So, this should clear up the question whether D1 lynches are useful or not, shouldn't it? #40 Huey -> Rune (1), as announced in #35. Huey had playfully challenged Rune (together with Boro and Sally) in his first post, focussed on Boro for a while, then begun to suspect Rune mildly based on Rune's 'overly-strong agreement' with his suspicion of Boro, repeated this point in #32 and pondered voting for Rune, which he did after being counter-suspected by Rune. Fairly coherent, perhaps a bit much so, since it was all based on one point in one post of Rune's, but of course we now know he was right. The only way I could see Huey doing this as a wolf would be if he's unexperienced at making up suspicions against innocents and thus resorted to wolf-on-wolf in lack of anything better, but if so it was rather daring in a pack of two. Seems genuine though, and I'd say he looks pretty good toDay. #43 Rune -> Zil, as announced in #41. Known wolf voting known innocent. Had previously surfed on Huey's suspicion of Boro, my own BoroMoon theory and Zil's observation that Huey was being jumpy, then turned on Zil after declaring that he wouldn't want to vote for Huey on his first day. In case there was any wolf-on-wolf afoot between Rune and Huey this sudden turn would make lots of sense. So does his reluctance to vote for a cobbler-candidate, if he really believed in this theory. #46 Boro -> Nerwen, out of the blue, because he didn't want to vote one of the active people, and because she'd be dangerous if a wolf. Random vote for a player who had just one early IC post, reasoning looking very much like he coughed it up ad hoc. Having slept over it I tend to agree with Zil (#53) that it was 'reckless for a wolf', but it didn't seem to me a vote with the village's best interest in mind. #48 Pitch -> Boro. I'll leave this one for you to analyse, but Boro had been worrying me for much of the Day. I also had mild suspicions of Huey and Zil, and Rune's sudden turn on Zil raised my eyebrows, but with the rules saying the first person to get a majority gets lynched I didn't feel bad enough about any of them to give them a second vote. Another vote for a player who had barely participated, based on reasoning that was rather meta. Not unlike Boro's vote, and spreading the votes thinner. I feel her pain about transatlantic deadlines, but I don't like this. #54 Zil -> Rune (2), as announced in #53. Known innocent for known wolf, because of the way he latched on to other's suspicions, 'then moved from all that to vote for me'. This got the wagon rolling leading to Rune's lynch an hour from DL and probably made Zil a target for the Night kill. #58 Sally -> Rune (3). Previously agreed with me about Boro's vote, but found lynching him too risky (duly noted), voted Rune 'purely to avoid a sudden shift we didn't expect'. This vote cemented Rune's fate right at DL-- or did it? Even if one of the other candidates had got another vote (which was unlikely at this time), Rune would still have been lynched based on the Rule of First. Thus Sally's vote looks good on first sight, but could well have been made by a fellow-wolf who found D1 had gone horribly wrong in her absence and pushed what's falling to dissociate herself from Rune. No vote: Nerwen, Morsul, Shasta. I'd really like to hear more from them toDay, and from yesterDay'S latecomers, Lal and Sally. I feel her pain about transatlantic deadlines, but I don't like this. Fair enough, I can see it doesn´t look great. In my defence all I can say is that it was 2am, I was a about to nod off when I remembered I hadn´t voted yet, I had a quick look at events so far but failed to clock that we already had four candidates. Anyway, good news about getting a wolf first lynch - we must have a rather worried lone wolf somewhere. I must say it is a nice refreshing change to play an old-school game with roles declared on death and no funny business. Not quite getting this by the way - I don´t see how Rune´s fate was necessarily already sealed at the time of Sally´s vote, even though it was very close to deadline. Lets say a Sally-wolf is trying to save fellow-wolf Rune. Why not vote for Boro or Zil, (Nerwen would not be such a good bet as she had herself not voted at this point and would obv vote to save herself) hoping that one of Nerwen, Morsul or Shasta would also come in at deadline vote in this way? That would give Boro or Zil three votes, to Rune´s two. Would it help if I promise to be less absent? And actually be watching the real game thread? I didn't think we were starting till after New Years, oops. Will dig into this tomorrow. Not to say that couldn't have happened, but with mere minutes to go, how likely was it that any of them would vote after not having showed up all Day? I am at a New Year dinner with family. Could someone please tell me the final vote tally at DL when the time comes? Pretty please and apologies.